Introduction: Gastrointestinal tract (GIT) lesions include a wide variety of lesions, which may be diagnostically challenging on histopathology and may be difficult to differentiate without the aid of immunohistochemical stains. 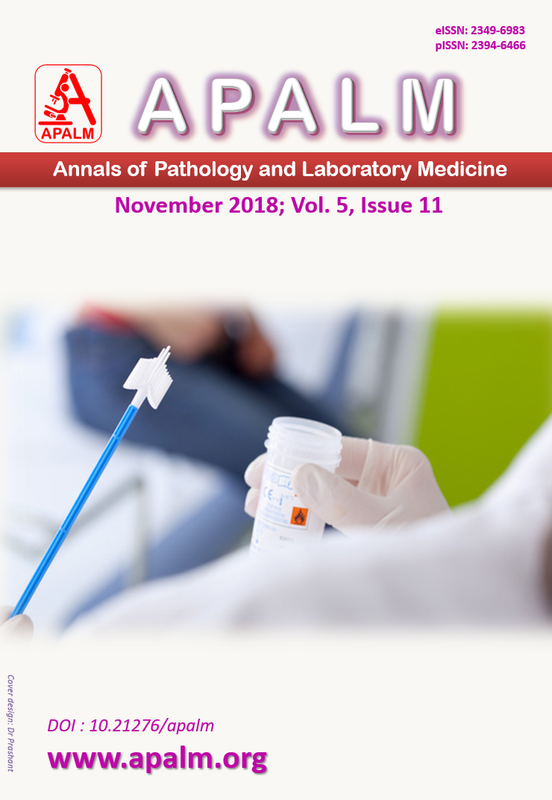 Objective: The present study was undertaken to histopathologically analyze the upper GIT lesions and determine the expression pattern of cytokeratin (CK) and mucin peptide core antigen (MUC) in these lesions and their usefulness in diagnosis. Material and Methods: A 135 cases with clinical diagnosis of upper GIT lesions including Barrett’s metaplasia (BM), carcinoma esophagus, gastric intestinal metaplasia (GIM) and gastric carcinoma were included. Standard diagnostic criteria were used in evaluating tissue sections and arriving at a diagnosis. Relevant clinical data including age, gender, complications and symptoms of disease were noted. Immunohistochemical evaluation of the lesions were done. The antibody panel included CK7, CK18, CK19, CK20, MUC1&MUC2. Results: Immunohistochemical pattern CK7-/CK20+ was seen in 85% gastric adenocarcinoma and 82% gastric intestinal metaplasia. CK7+/CK20- was characteristic of esophageal adenocarcinoma. CK7+/CK20+ pattern was characteristic of Barrett’s metaplasia. MUC1 and MUC2 expression was seen in both goblet and non goblet cells in Barrett’s metaplasia, MUC1 in both gastric intestinal metaplasia and MUC2 in only goblet cells. MUC2 is a good marker of mucinous carcinomas of esophagus and stomach. Conclusions: Pre-neoplastic and neoplastic lesions of the gastrointestinal tract are varied yet histologically challenging, often prove to be a diagnostic dilemma. Understanding unique immunohistochemical profiles of each, combined with histopathological and endoscopic correlation greatly assists in the diagnosis and management of these lesions. Senior research Fellow National Institute of Pathology,Indian Council of Medical Research Safdarjung Hospital Campus,New Delhi 110029. 2. Wong HH, Chu P. Immunohistochemical features of the gastrointestinal tract tumors. J Gastrointest Oncol 2012;3:262-284. 3. Ronald M, Werner WF, Renhard et.al. Catalog of human cytokeratin pattern of expressionin normal epithelia tumors and cultured cells. Cell 1982; 31:11-24. 5. Davison JM, Ellis ST, Foxwell TJ, Luketich JD, Gibson MK, Kuan SF, Nason KS. MUC2 Expression is an Adverse Prognostic Factor in Superficial Gastroesophageal Adenocarcinomas. Hum Pathol. 2014;45:540–548. 6. DeMeester SR, Wickramasinghe KS, Lord RV, et al. Cytokeratin and DAS-1 immunostaining reveal similarities among cardiac mucosa, CIM, and Barrett’s esophagus. Am J Gastroenterol 2002;97:2514-23. 7. Polkowski W, van Lanschot JJ, ten Kate FJ, et al. Intestinal and pancreatic metaplasia at the esophagogastric junction in patients without Barrett’s esophagus. Am J Gastroenterol 2000;95:617-25. 8. Spechler SJ. Clinical practice. Barrett’s esophagus. N Engl J Med 2002;346:836-42.
. Defining Cancer Risk in Barrett’s Esophagus: A Pathologist’s Perspective. Gastrointestinal Cancer Research 2008; 2:308-10. 10. Hussain I S, Reshi R, Akhter G, Beigh A.Clinico Histopathological Study Of Upper Gastrointestinal Tract Endoscopic Biopsies. Int J Cur Res Rev 2015; 78-85. 11. Krishnappa R, Horakerappa MS, Karar A, Mangala G. A study on histopathological spectrum of upper gastrointestinal tract endoscopic biopsies. Int J Med Res Health Sci. 2013;2:418-24. 12. White N, Gabril M, Ejeckam G, Mathews M, Fardy J, Fady K, Dore J, Yousef GM. Barrett’s esophagus and cardiac intestinal metaplasia: Two conditions within the same spectrum. Can J Gastroenterol 2008; 22: 369-75. 13. Bosman FT. World Health Organization. ; Inter- national Agency for Research on Cancer. WHO classification of tumors of the digestive system. 4th ed., Lyon: IARC Press, 2010. 14. Erkan G., Gonul Il, Kandilci U, Dursun A. Eval- uation of apoptosis along with BCL-2 and Ki-67 expression in patients with intestinal metaplasia. Pathol Res Pract 2012; 208: 89-93. 15. Correa P, Piazuelo MB, Wilson KT. Pathology of Gastric Intestinal Metaplasia: Clinical Implications. Am J Gastroenterol. 2010 ; 105: 493–98. 16. Fennerty MB. Gastric intestinal metaplasia on routine endoscopic biopsy. Gastroenterology 2003;125:586–90. 17. Sergii V. Cytokeratins as Molecular Markers in Differential Diagnosis of Gastric Intestinal Metaplasia. J Cytol Tissue Biol 2015; 2: 007. 18. Ormsby AH, Goldblum JR, Rice TW, et al. Cytokeratin subsets can reliably distinguish Barrett’s esophagus from intestinal metaplasia of the stomach. Hum Pathol. 1999;30(3):288–294. 19. Ormsby AH, Vaezi MF, Richter JE, et al. Cytokeratin immunoreactivity patterns in the diagnosis of short-segment Barrett’s esophagus. Gastroenterology. 2000;119(3):683–690. 20.	van Baal JW, Bozikas A, Pronk R, et al. Cytokeratin and CDX-2 expression in Barrett’s esophagus. Scand J Gastroenterol. 2008;43(2):132–140. 21. Kurtkaya-Yapicier O, Gencosmanoglu R, Avsar E, Bakirci N, Tozun N, Sav A. The utility of cytokeratins 7 and 20 (CK7/20) immunohistochemistry in the distinction of short-segment Barrett esophagus from gastric intestinal metaplasia: is it reliable? BMC Clin Pathol. 2003;3(1):5. 22. Gulmann C, Shaqaqi OA, Grace A, et al. Cytokeratin 7/20 and MUC1, 2, 5AC, and 6 expression patterns in Barrett’s esophagus and intestinal metaplasia of the stomach: intestinal metaplasia of the cardia is related to Barrett’s esophagus. Appl Immunohistochem Mol Morphol. 2004;12(2):142–147. 23. Voltaggio L, Montgomery EA, Lam- Himlin D. A Clinical and Histopathologic Focus on Barrett Esophagus and Barrett-Related Dysplasia. Arch Pathol Lab Med. 2011;135:1249–1260. 24. Singh A, Kapur S, Chattopadhyay I, Purkayastha J, Sharma J, Mishra A, Hewitt SM, Saxena S. Cytokeratin immunoexpression in esophageal squamous cell carcinoma of high-risk population in Northeast India. Appl Immunohistochem Mol Morphol. 2009 ; 17:419-24. 25. Philippe T, Giovanna BS, Saurin JC, Lombard- Bohas C, Boulez J, Berger F.et.al. Cytokeratin expression in adenocarcinoma of esophagogastric junction: A comparative study of adenocarcinoma of the Distal esophagus and of the stomach.Am J of Surg Pathol. 2002;26:1213-21. 26. Ectors N, Driessen A, Hertog G, Lerut T, Geboes K. Is Adenocarcinoma of the Esophagogastric Junction or Cardia Different From Barrett Adenocarcinoma? Arch Pathol Lab Med. 2005;128:183–85. 27. Lam KY, Loke SL, Laifer J.Cytokeratin pattern in non neoplastic esophageal epithelium and squamous cell carcinoma. Virchows Arsh 1995;426:345-349. 28. Davison JM, Ellis ST, Foxwell TJ, Luketich JD, Gibson MK, , Kuan S et.al. MUC2 Expression is an Adverse Prognostic Factor in Superficial Gastroesophageal Adenocarcinomas. Hum Pathol. 2014; 45: 540–48. 29. Flucke U, Steinborn E, Dries V, et al. Immunoreactivity of cytokeratins (CK7, CK20) and mucin peptide core antigens (MUC1, MUC2, MUC5AC) in adenocarcinomas, normal and metaplastic tissues of the distal oesophagus, oesophago-gastric junction and proximal stomach. Histopathology. 2003; 43:127–34. 30. Di Maio MA, Kwok S, Montgomery KD, Lowe AW, Pai RK. Immunohistochemical Panel for Distinguishing Esophageal Adenocarcinoma from Squamous Cell Carcinoma: A Combination of p63, Cytokeratin 5/6, MUC5AC, and AGR2 Allows Optimal Subtyping. Hum Pathol. 2012; 43: 1799–1807. 31. Kijima H, Chino O, Yamazaki H. Immunohistochemical MUC1 (DF3 antigen) expression of human esophageal squamous cell carcinoma. Anticancer. Res. 2001;21:1285-89. 32. Song ZB, Gao SS, Yi XN. Expression of MUC1 in esophageal squamous cell carcinoma and its relationship with poor prognosis of patients from Linzhou city, a high incidence of northern China. World J Gastroentrology.2003; 9:404-07. 33. Arul GS, Moorghen M, Myerscough N, Alderson DA, Spicer RD, Corfield AP. Mucin gene expression in Barrett’s oesophagus: an in situ hybridisation and immunohistochemical study. Gut. 2000; 47:753–761. 34. Chinyama CN, Marshall RE, Owen WJ, Mason RC, Kothari D, Wilkinson ML, Sanderson JD. Expression of MUC1 and MUC2 mucin gene products in Barrett’s metaplasia, dysplasia and adenocarcinoma: an immunopathological study with clinical correlation. Histopathology. 1999; 35:517–524. 35. Demicco EG, Farris AB 3rd, Baba Y, Agbor-Etang B, Bergethon K, Mandal R, Daives D, Fukuoka J, Shimizu M, Dias-Santagata D, Ogino S, Iafrate AJ, Gaissert HA, Mino-Kenudson M. The dichotomy in carcinogenesis of the distal esophagus and esophagogastric junction: intestinal-type vs cardiac-type mucosa-associated adenocarcinoma. Mod Pathol. 2011; 24:1177–1190. 36. Celso AR, Leonor D, Correa P. Intestinal metaplasia of stomach displays distinct patterns of mucin (MUC1, MUC2, MUC5AC, MUC6) expression. Cancer Res.1991;59: 1003-07. 37. Silva E, Teixeira A, David L. Mucins as key molecules for the classifications of intestinal metaplasia of stomach. Virchows Arch. 2002;440:311-17.